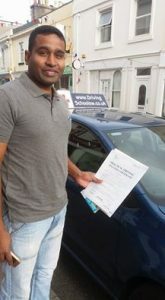 Navratnam has been having Driving lessons in Paignton and has passed his Driving Test. After the disappointment last time of the smallest rollback ever costing him, this time he held his nerve at the start and had a cracking drive. Darren his Driving Instructor who works for The Driving School sw said “I’ll miss our early starts……..stay safe and hope the move goes well”. For local Driving Lessons contact www.thedrivingschoolsw.co.uk or call 01803 640607 we cover Torquay, Paignton, Brixham, Newton Abbot and all surrounding areas.